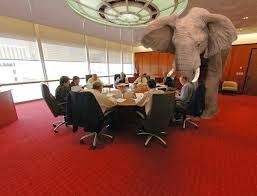 This situation raises a question about just how many elephants there might actually be in the C-Suite and Boardroom. Given that there is a new CEO just recently having taken the helm, even though a long-time insider, it's not immediately clear that the "interest" picture isn't muddled in a Gordian Knot like manner. GM is a huge enterprise, and despite the involvement of fatalities which are presumed in hindsight to have been avoidable, it seems far from clear to me how accountability for a thread like this one works on the scale of operations overseen by executive management or of their actions by the Board. It seems to me that these risk management in large corporation cases take on meaning on several different levels only one of which is statistically measurable. As for the conflict of interest issue, it seems that when you have two very high level investigations going on then the CEO may be forgiven for relying upon a know quantity to advise regarding the collective significance of the events and their subsequent fallout impact on the entire corporation. Considering some of the so-called "independent" assessment reports I've read, I'd think twice about bringing in some group that didn't know my firm and didn't know my business. The recent WIPP Review by EM is an example that can make points on both sides of this debate I suppose. The BP Independent Review (Baker et. al.) done after Texas City is an example of this kind of exercise - can anyone say with confidence that it justified its expense in terms of the net benefits gained. Surely in light of Deepwater Horizon it is easy to imagine it might have done more good. But until you've had to implement one of these laundry lists developed by experts I'd say this - never conduct a high-level review that you've not already thought through the end play of before you launch it. That is not the same as dictating the conclusions, but the chartering official has lots of control over which dark corners get looked into when. In the midst of a major crisis putting a lot of exceptional demand on senior management, some prudent triage is in order - it's not fraudulent as some might protest.